Syria has been particularly in focus of the media since 2011, where since a proxy war with many regional players, the Syrian regime, jihadist groups and the so-called Islamic State are fighting a relentless fight for dominance in the country. According to UN, several hundred thousand people have been killed and almost half of the population of the country displaced. Many books appeared recently examining the Syrian conflict. Yet many regard the conflict “either as a dramatic struggle between a brutal dictator and his freedom-seeking masses or as a reaction to an alleged recent rise of political Islam,” says Mark Tomass. Other more realistic treatments in recent books on the Syrian conflict identify it as arising between Islamist groups and a secular state, while mainly examining the conflict only in its recent manifestations, from the time of the Muslim Brothers’ revolt of 1976–82 up to its recent resurgence in today’s Syria. 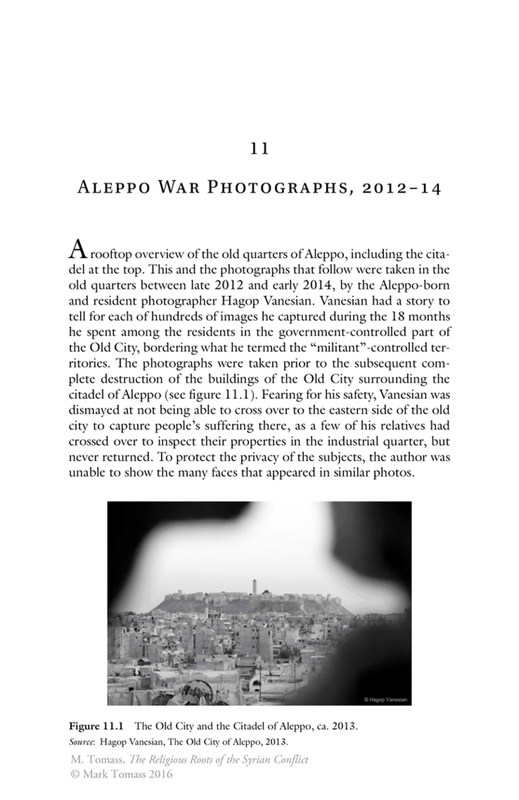 This book is seeking an alternative to the mainstream narrative describing the Syrian conflict. It is a broad interpretation of events offered by a Syrian native, born, raised, and educated in Aleppo, Syria. According to the author, the present book explains the significance of religious and sectarian identities to the inhabitants of the Fertile Crescent by delineating the social forces that led to their formation and the psychological forces that maintain them. The author employs ethnographic accounts using anthropology and conceptual tools based in economics to describe the formation of sectarian groups, a multidisciplinary approach which details how the sects have consistently generated civil conflicts within the Fertile Crescent, both before and after the formation of the nation-states of Lebanon, Iraq, and Syria. The book accounts for key periods spanning the last two millennia that played a role in defining the current scene in Syria and the Fertile Crescent. Chapter 1 (The Significance of Religious Identity) argues that understanding religious identity is central to understanding the Syrian conflict. In the multi-ethnic, multi-religious, or multi-sectarian settings of the Fertile Crescent,wherein religious or sectarian affiliation is the predominant source for social values, individuals prioritize their religious and sectarian identities. chapter 2 (The Fertile Crescent Meets the Muslim Arabs) describes the perceptions of the sectarian Christian groupings in the Fertile Crescent of the Muslim Arab conquerors. Chapter 3 (Formation of the Jewish Identity) presents a brief biblical narrative and subsequent historical accounts of the circumstances that formed the Jewish identity in the Fertile Crescent. 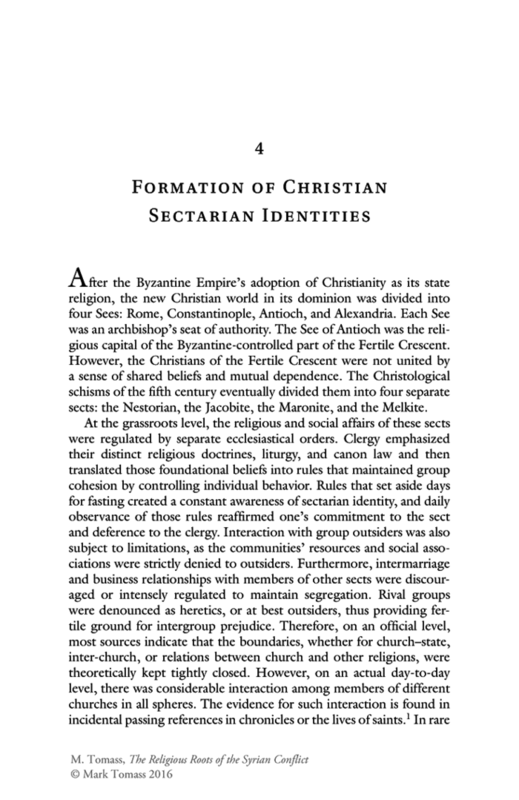 Chapter 4 (Formation of Christian Sectarian Identities) provides historical context for the ongoing tension between sectarian identification and nationalism within the Fertile Crescent by describing the creation of Christian sectarian groups in the Middle East. Chapter 5 (Formation of Muslim Sectarian Identities) traces the events and individuals that played a role in forming the Muslim sects in the Fertile Crescent and briefly outlines their belief systems. Chapter 6 (The Islamization of the Fertile Crescent) examines the processes that Islamized the inhabitants of the Fertile Crescent and their legacy for modern times. 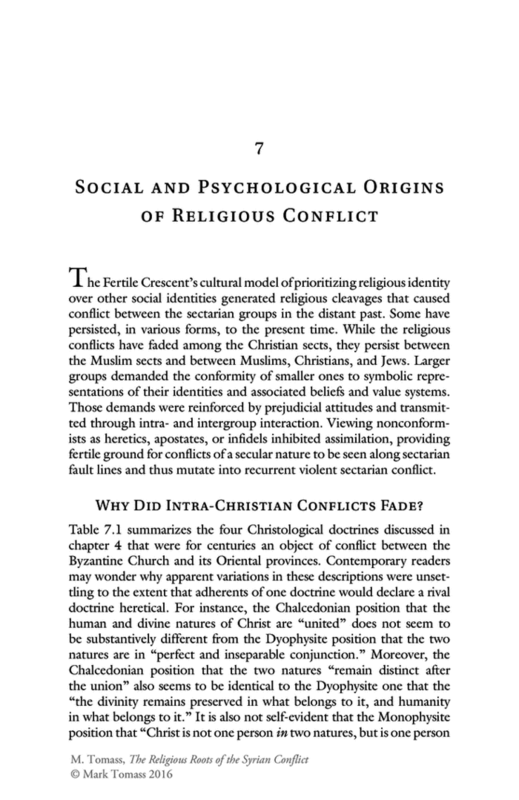 Chapter 7 (Social and Psychological Origins of Religious Conflict) analyzes the social and psychological roots of the religious cleavages that caused conflict between the sectarian groups in the distant past and those that have persisted, in various forms, to the present time. Chapter 8 (The New Media and the Islamic Awakening) explores the role of the new media in ushering in the decline of secular ideology and diverting the Islamic Awakening into an inter-sectarian competition in the Fertile Crescent. Chapter 9 (From the Arab Spring to the Revolt of the Sunna) describes the struggle of Syria’s ruling elite in the past five decades to maintain a secular state while attempting to contain popular pressure to adopt Islamic values and that elite’s ultimate failure to prevent religious sectarianism from fueling the political action that has culminated in violent conflict. 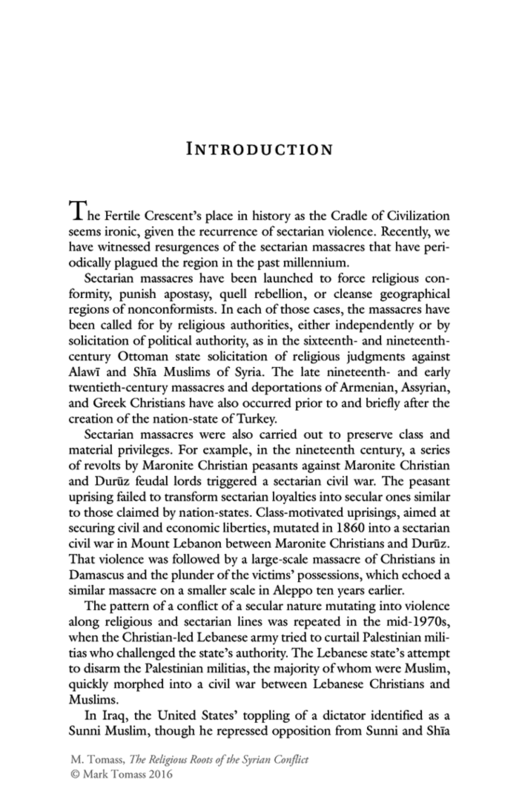 Chapter 10 (The Remaking of the Fertile Crescent) argues that the absence of abstract morality, manifesting itself in dominant kinship and sectarian loyalties, renders the abstract, impersonal nature of legal systems in the nation-states of the Fertile Crescent ineffective in regulating social and economic relationships because the power structures are not capable of enforcing them, nor is the population willing to abide by them. 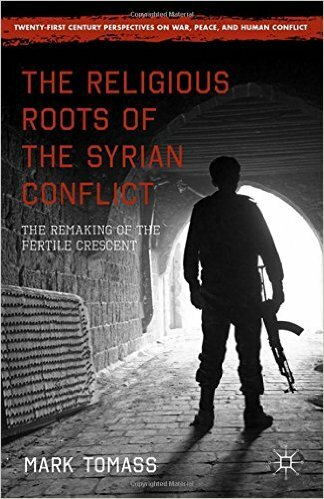 "With particular relevance to understanding the genesis of the regional civil war sparked in 2011 as a result of the 'Arab Spring,' (this book) contains thoughtful and illuminating portraits of Syria's religious and sectarian communities, describes their origins and development over time, and identifies sources of intractable conflict among some groups. Tomass provides useful and moving contributions to our understanding of these societies and communities as he engages with and advances recent scholarship." "A richly documented, highly readable book. Tomass moves beyond the jargon, theory, and partisanship that have so obscured successful strategy with regard to the Arab and Muslim region. Reading these pages points both to the need to recognize the justified passing of the democratic nation-state ideal in the region and the possibilities for multi-religious tolerance there, however remote." "Utilizing a superb systematic approach of material culture and drawing on personal experience, Tomass weaves a well framed and engaging narrative of the Syrian conflict through a multi-disciplinary lens. His theory and analysis of religious/sectarian identity and its role and usage by communities and elites, internally and externally, and throughout the historical continuum of Syrian history, finally elucidates a feasible alternative to the overly simplistic and romanticized assumption of laying the blame solely at the foot of external actors. He grants the people of Syria themselves the agency of possibility but also culpability in the current state of unrest." The book appeared by Palgrave Macmillan, Series: Twenty-first Century Perspectives on War, Peace, and Human Conflict as Hardcover (281 pages) with the ISBN-13: 978-1137531490 and is available in book shops.